School district All Olentangy Lsd 2104 Del Co.
Lewis Center, Ohio, is an unincorporated community based in the northwestern region of Delaware County. If you possess a college degree, then you’ll really be in good company here. Nearly 63 percent of Lewis Center adults hold a bachelor’s degree or higher. This town is also very family-oriented because kids ages 5-17 make up about 27 percent of the population. 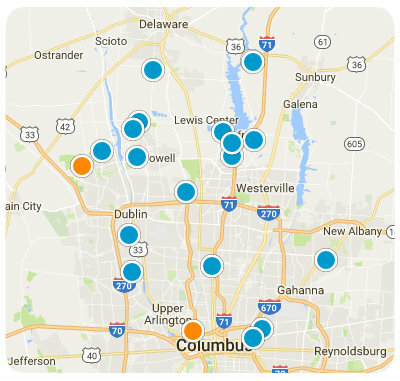 Homeowners in Lewis Center go to Columbus Pike for dining and errands. The BrewZaa is a popular place around that street for hanging out with friends over food and drinks. You can order items like pizza, sandwiches, salads, burgers and other menu entrees. It also has flat screen televisions, so you catch watch your favorite sports games while enjoying your meal. Travel about nine miles to Delaware, Ohio, to visit Alum Creek State Park. It contains a beach area where you can soak up the sun’s rays and mingle with other beachgoers. The park also has a fishing area, a dog park, campgrounds, hiking trails and more. Another park to check out is Highlands Metro Park. Besides outdoor recreational activities, this park is home to a nature center that teaches about Highlands’ cultural and natural history, plus it feeds and displays wildlife. Bring the whole family to Little Bear Golf Club, a golf club open to the public. It has three golf courses: a 9-hole course, an 18-hole course, and an 11-hole course. Other amenities there include a bar and grill, a fitness center, a massage service and a clubhouse. Schools in the Lewis Center area are operated by the Olentangy Local School District. It runs 15 elementary schools, five middle schools, and three high schools. This town also offers a school that imparts trades skills. If you’re raising a family and yearn for a single family home, then you’re in luck! Over 90 percent of Lewis Center homes are single family residences. Many homes in Lewis Center are also fairly young since they were constructed during the year 2000 or later. About 61 percent of residences here have four bedrooms, which is a great thing to know if you have a relatively large family. Think about buying your first or next home in this city. It has a low crime rate, excellent schools and it possesses a strong economy. If you have questions related to real estate properties in Lewis Center, Ohio, don’t hesitate to contact us.